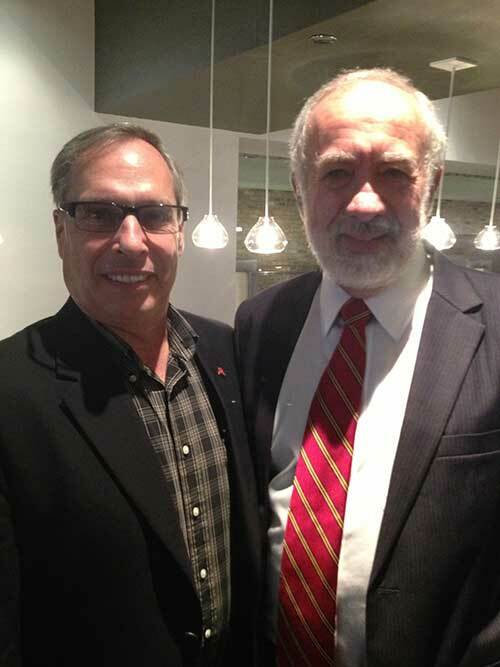 Print 13 started out very nicely for me as my first official meeting was a breakfast meeting on Sunday morning with Benny Landa and three of my “packaging” colleagues, Danielle Jerschefske of Labels and Labeling Magazine, Pat Reynolds of Packaging World and Yolanda Simonsis of YTC Media. At the very relaxed event at a downtown Chicago hotel, Benny (as I now call him because we are “buds”) shared with us the updates on the packaging versions of the new nanographic digital press line that was introduced at drupa last year. There will be numerous articles written on this topic but few will have the “packaging spin” that this one will as I will focus on the items my readers are most interested in. I suggest you read the article by my colleague, Cary Sherburne, also on WTT, to get her keen insights; she was invited to a special session at Print13 for the commercial side of the house. Included with her article is the Landa Press Release around these announcements. New ink “ejectors” – I think it interesting that they continue to call them “ejectors” when the rest of the world calls them inkjet heads but that is part of the mystique of Landa. The resolution of the “ejectors” has gone from the drupa 600 dpi to 1200 dpi today. Speculation is that this is being done with new Kyocera heads, ooops, ejectors, but that was not confirmed or denied when I asked. This is likely one of the key reasons they have been able to increase print quality as much as they have. It is also a reason they will be able to control nozzle dropout problems as the systems go online. 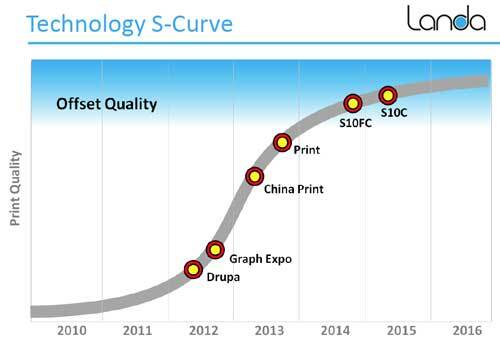 The Quality “S” Curve – Shared with us was a graph they use to show where they were and are going related to print quality. They fully admit the quality has been sub-par and needs to improve. On the curve you can see they feel they are almost at “offset” quality and plan on being will within that range by next years beta. Quite honestly the image quality I saw over breakfast was sellable for most uses, better is always better and I am sure we only saw “the good stuff” but I was encouraged. Issues of printing on various coated and uncoated stocks as well as virgin and recycled boards don't seem to intimidate them due to the way the ink layer is transferred from a printing blanket to the substrate in a solid rather than liquid form. This could be an advantage over systems that jet UV or Aqueous inks directly to the board where spread and adhesion can be challenging. This could have real benefits to carton producers looking for an edge. FDA Compliant Inks – As the print samples were being passed around the table while we were still drinking coffee and munching on something sweet, it was noticeable that there was on odor coming from the print samples as you would usually notice from digital samples. This is due to the inks being water based and maybe from the strong smell of the Starbucks coffee. The company claims the inks are all FDA compliant and with low or no odor they will be good for cosmetic and pharmaceutical work as well. This needs to be validated but it is a good sign. The New Operator “Cockpit” – If you are reading this far into the article you have likely seen the original Landa press shown at drupa. When looking at the huge “iPad” type control screen stuck to the front of the press my business partner, Jeff Wettersten, said to me “now that looks like a forklift accident waiting to happen”. It seems that others, some of the 120 customers the company says they visited to gain feedback, told them the same thing. So the new version has this interactive cockpit for the operator to work in more of a conventional environment. On the screen are video monitors with real-time shots from critical areas inside the press and all the critical operating functions right next to the output tray. They even have a viewing table (where is the back of the light booth?). My question to Landa and the others with digital printing solutions is; “Why would I want an analog coating system on my digital press?” The pragmatic side of me knows the difficulties of integrating a digital coating station but the idea of a static coating system on a digital press just seems counter intuitive to me. There has to be high speed jetting (ejecting) systems out there that could jet coating solutions at the speeds and (low) resolutions needed for digital coatings. I am sure that these conventional coating solutions are simply stopgap solutions and that a true digital solution is just a matter of time but I would have thought that if anyone were to bring that to the market first it would have been Landa. Note that when looking at the overall diagram of the S10 the coating unit is called out as the white unit after the print engine and the large gray unit between the coater and the delivery is the dryer for the coating. The print unit does not require a dryer as the ink is dry from the time it is transferred from the blanket to the substrate. Not a Niche Printing Press – The notion that the Landa presses will be for short run digital use was totally dismissed. It is clear that mainstream production is the target for the Nanographic technology. In the presentation Benny showed the popular slide of where digital and analog technologies play now with a gap in the middle of production volumes where his presses nicely fit. It is clear they do not see their presses playing niche roles in the production of folding cartons or even flexible packaging in the not to distant future but playing a major one in terms of jobs and volume produced. Question of Throughput - A few questions were raised at the meeting that I worked with the Landa team to clarify and I have received that clarification on this question today. Originally the system had eight ejector bars (two each for CMYK) this gave the system the ability to print 13,000 sheets per hour. Now the system has a standard configuration of one set of CMYK ejectors that will give a 6500 sheets per hour rating. They say there is a future option for an added CMYK set of ejectors to get the system to 13,000 sheets. This however will likely jeopardize the extended color gamut plans the company plans. Extended Color Gamut - Benny was very excited about, the use of extended color gamut printing using, CMYK +OVG on the Landa presses. It is interesting to see the level of excitement the company seems to have on this topic, it almost felt as thought this was a new line of thinking. In fact, this topic has been discussed in packaging circles for the better part of the last decade. Outside of a few instances it has yet to gain major traction while it is of keen interest to Brand Owners and Converters alike. I see the obvious upside potential of its application but also see the issues holding it back from full scale adoption. These Nanographic presses coming into the market may add some weight to the positive side of the scale, may help the tipping point, for extended gamut printing to become mainstream. That is yet to be seen but it is an intriguing prospect. Not So Final Note – My final thought on this article… undoubtedly there will be many more on the topic… I am pleased with the prospects that my new BFF, Benny has laid out for us. Yes the timing is not what some had hoped but it is what realists projected. While it is not rocket science, it is pretty complicated and they had a long way to go coming out of drupa. Frankly I am impressed with the progress they have made and thank the Landa team for including me with “the Packaging People”. presses now? Higher res, smaller dots all impact speed of production as well data I/O. Wow this stuff is really moving around now. When you build a press you get "unknown unknowns" so predicting when something will be done is more difficult and can become years of time. It will be intriguing to see if this new technology possesses the disruptive potential it appears to have. If Mr. Landa succeeds as he envisions, will this be more of an evolutionary or revolutionary advancement in printing? Kevin one issue in coating may be as you state and Benny may solve by treating "like with like" or by partnering with SCODIX. True Kevin Coatings are literally & figuratively "Fluid" and the winner may be either H2O and or UV cure based - ytbd but in packaging we agree this too will be critical.